Photo courtesy of Family Tree Farm. With the amazing weather this past weekend, the folks over at Family Tree Farm - Red Lion, PA took advantage and decided to plant the 2015 crop of Christmas trees. 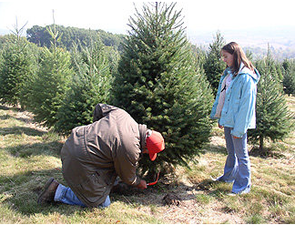 Family Tree Farm made our regional top 10 this year for Christmas tree farms. See the below video to watch the process, and read more related articles, too. It was a beautiful weekend to plant trees! They should be ready to harvest for Christmas in about 6 or 7 years.....Cassondra Leiphart is becoming quite the expert planter!